We just finished the rush of our county 4H fair! I love fair week; and I’m glad it’s over till next year. When we finally got back to tending the farm, we discovered the red raspberries beginning to ripen. Looks like a great crop! If you like these delicious gems, think about coming over to pick some for your table and your freezer. If you don’t live close to southern Indiana, then find a berry grower near you. Red Raspberries are easy to make into jam or pies, and even easier to freeze. To freeze place them on a cookie sheet in a single layer and freeze until firm. Then package in zip-lock bags or food saver vacuum sealed bags. Label and put in the freezer to enjoy all winter long! 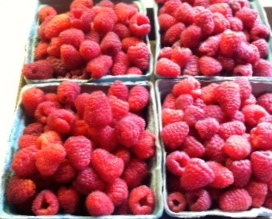 Red Raspberries can be used in a plethora of delightful culinary ways; explore and relish. Enjoying raspberries is another of life’s simple pleasures not to be denied! This entry was posted in activities, DIY, food preservation, for purchase, Life's Simple Pleasures, PYO berries, Seasonal and tagged freezing berries, red raspberries, u-pick red raspberries. Bookmark the permalink.